They say it’s a male dominated world and Bollywood is definitely not an exception. Male superstars have always called the shots in the Hindi Movie Industry but nevertheless female actors used to be a force to reckon with. The craze and following for actresses was at par, if not more, than their male counterparts of that era. But over the years, the superstardom of female actors has shown a consistent downhill trend. 1. Sridevi and Madhuri Dixit (10/10): Carrying forward the legacy of Hema Malini (probably the only leading lady to single-handedly dominate the industry during her time) the Sridevi and Madhuri Dixit combo dominated the industry for around 2 decades which is a phenomenal achievement in itself. While Sridevi’s peak period was during the second half of 80s, Madhuri touched the pinnacle of success in the first half of 90s. Even the likes of Sunny Deol and Rajinikanth played supporting roles in 1989 blockbuster ‘Chaalbaaz’ which rode on Sridevi’s magnetic charisma alone. Such was the phenomenal stardom of Madhuri Dixit that all the leading distributors renamed the 1995 blockbuster ‘Raja’ to ‘Rani’, as the movie was heavily panned by critics but still became a huge success due to Madhuri’s starpower. Both of them individually starred in some of the classic movies of Indian Cinema like ‘Mr. India’, ‘Chandni’, ‘Hum Aapke Hain Kaun’ and ‘Saajan’ to name a few. The space here is too less to mention the achievements of these 2 legendary female actors. 2. Juhi Chawla, Kajol and Karishma Kapoor (8/10): Kajol emerged as the most successful lady of this group with a string of super hit movies like ‘Dilwale Dulhania Le Jayenge’, ‘Ishq’, ‘Pyaar Kiya To Darna Kya’, ‘Kuch Kuch Hota Hai’, ‘Kabhi Khushi Kabhi Gham’ and many more. When she left movies for marriage, Kajol was at the peak of her career. Karishma Kapoor, who was labeled as the mass heroine given her superhit association with Govinda-David Dhawan, entered the big league with ‘Raja Hindustani’, ‘Dil To Pagal Hai’ and ‘Biwi No.1’ opposite the mega Khans. Juhi Chawla formed the leading trio of actresses along with Madhuri and Sridevi in the early 90s. She was phenomenal in movies like ‘Darr’, ‘Hum Hain Rahi Pyaar Ke’, ‘Bol Radha Bol’ and ‘Ishq’. 3. Aishwarya Rai, Rani Mukerji and Preity Zinta (8/10): Aishwarya Rai showed a lot of promise with back to back hits ‘Hum Dil De Chuke Sanam’ and ‘Taal’ in 1999. She is considered as one of the most stunning female actors to have appeared on the silver screen. She later proved her versatility with Devdas, Dhoom 2 and Jodha Akbar. Rani and Preity started around the same time in 1998 and during 2001-2005, their stardom peaked with movies like ‘Saathiya’, ‘Chalte Chalte’, ‘Bunty and Babli’, ‘Black’, ‘Hum Tum’, ‘Kal Ho Naa Ho’, ‘Veer Zaara’, ‘Dil Chahta Hai’, ‘Koi Mil Gaya’ and ‘Salaam Namaste’. After 2005, it has been a tough ride for both of them, even as Aishwarya has taken a sabbatical post her marriage to Abhishek Bachchan. 4. Priyanka Chopra and Kareena Kapoor (6/10): Priyanka Chopra and Kareena Kapoor established themselves as Bollywood’s topmost actresses in the first decade of the new millennium. They rose to stardom by showcasing their immense talent in movies like ‘Aitraaz’, ‘Fashion’, ‘Barfi’, ‘Jab We Met’, ‘Omkara’ and ‘3 idiots’ to name a few. Both of these actors are currently very much active in the mainstream cinema and can add a few more feathers to their caps, but the shift towards the younger lot will not let it happen easily though. 5. Deepika Padukone and Katrina Kaif (7/10): Deepika and Katrina are vying for the top honors in the last few years. Deepika is having clear edge currently thanks to 5 back to back hits in ‘Cocktail’, ‘Race 2’, ‘Yeh Jawaani Hai Deewaani’, ‘Chennai Express’ and ‘Ram Leela’. Katrina is also maintaining an enviable success rate as she has been a part of superhits like ‘Namastey London’, ‘Singh Is King’, ‘Zindagi Na Milegi Dobara’, ‘Ek Tha Tiger’, ‘Mere Brother Ki Dulhan’ and ‘Dhoom 3’. As it is clear from the above mentioned groups, the reign of female actors is limited and the shelf life is decreasing as the years are passing by. While a Sridevi or a Madhuri was easily the topmost heroine for more than 10 years, it’s slowly getting harder to maintain the top position for even 5 years these days. The story is entirely different as far as the male department goes where Salman, Aamir, Shahrukh, who were the top actors during Sridevi-Madhuri era, are still ruling the roost. Will Sridevi/Madhuri remain the last genuine female superstars of Bollywood? Can Deepika/Katrina or any one from the younger lot be able to revive the legacy of Sridevi/Madhuri? Will there be a dearth of Male superstars also after the Khan era? We are anxious to know your views on the above questions. Please share them in the comments section below. Also, let us know who was the most complete actress (both popularity and talent-wise) since the 1980s. 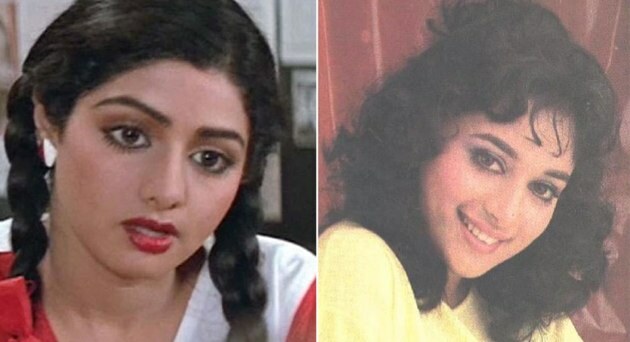 Who was the most complete star actress since the 80s? Will Aamir Khan’s son Junaid join the film industry? I love all. .but Aishwarya and madhuri are my favs. .
Aish is the most beautiful actress i have ever seen in my life. .madhuri is very charming. .
Shridevi is good,but i haven’t watched much films of her. .
Kajol,karisma are good actress too. .kat is the only one in the list who cann’t act. .i liked her in znmd as she was looking comfortable in that role. .
Deepika is overrated. She is not that great actress.sometimes she becomes expressionless. .
Pc and anushka are fully talented a energetic. .i love shraddha too. .sonakshi should stop doing same genre. Madhuri is most complete actress in the list. And kat is most incomplete actress here. .
Why do younger actresses need to revive the legacy of old actresses like Sridevi or Mahuri? Let them be and act themselves. Where is vidya balan? ? ? ?how cud u ignore her? We are not ignoring Vidya Balan. She is one of the most talented we have today. But the list is only about those stars who were considered for the top spot during that era. There are few other equally popular names which we have to give a miss like Manisha or Raveena. Hope its clear, keep the comments and queries coming. Sridevi and Madhuri are top 2 for sure in every departments like stardom, acting skills in their peak. Aishwarya would be 3rd in my list followed by Kajol. Deepika is most popular actress ‘today’ from past one year, and Priyanka is most talented actress ‘today’ out of those actresses. one and only madhuri.she is the most perfect and complete actress of bollywood. Madhuri is a boring actress. Sridevi and others are much better. vidya is not a star she was only good in kahaani and little bit in bhool bhulaiya also she is not a good dancer and a heroine can,t complete without dance. @Indicine….U should also consider Divya Bharti!! !how could U forget Her???? ?i think personally,if She was alive;she would be definitely No.1 in this list…….but still U can’t ignore her!!! Madhuri Dixit in her entire carrier gave 11 successful films namely Tezaab,Tridev(Multisatrrer #Second Lead to Sonam),Dil(Kiss Scenes),Beta,Raja,Khalnayak,Saajan,Him Aapke Hain Kaun(well made movie with ensemble cast),Dil To Pagal Hai,Ram Lakhan (#Multistareer),Devdas (#Second Lead) and Sridevi gave 11 hits with Jitender only…. I will put some points which will clear everything..
gair kanooni was a solve jublie hit …just because of her presence..
@mr. abhishek sharma, so you too are a biased fan of khans. because of this attitude, you don’t see other superstars. when you are busy overrating khans and making them the top most 24 hours a day, when will you find to concentrate on others ?? dearth of superstars ?? pleasee Hrithik Roshan,Akshay Kumar and Ajay Devgn are all superstars. while Akshay and Ajay enjoyed the stardom late in their career, Hrithik was giving the so called khans a run for their money since his debut. Even stars like Emraan Hashmi,Irrfan Khan,John,Ranbir and Shahid can rise to top level if given chance. Stop overrating the khans, just like madhuri and sridevi, these overrated khans should have taken a back seat by now but they are too greedy to do that and their fans are too retarded to let go of them. thanks for replying.but vidya is the only actress who made a film blockbuster(TDP) by herself while actresses like kat and bebo became more popular after doing movies with big male stars. sorry but aishwariya rai is hugely overrated.. I agree with you Nipun Vidya should have been in the list . She has given some brilliant performances like Parineeta, Bhool Bhulaiyaa, Paa, Ishqiya, The Dirty Picture and Kahaani . Anyway i agree with indicine that Madhuri and Sridevi are definitely female superstars . Sridevi has given some fabulous performances in Sadma, Chaalbaaz, Lamhe, Chandni, Mr. India, Judaai, English Vinglish . On the other hand Madhuri has given some fabulous performances in Tezaab, Dil, Beta, Hum Aapke hain Koun, Dil Toh Paagal Hai, Devdas . Both have given some brilliant performances and also were part of huge commercial blockbusters . Other than Madhuri and Sridevi all the actresses like Kajol, Juhi, Karishma, Aishwarya, Rani, Priety, Kareena, Priyanka, Deepika and Katrina are all very good . Overall i would say a very nice article brilliantly compiled by indicine . Now my current fav. actresses are Deepika,Anushka,Sonakshi,Kangana and Shraddha.